Was Satan Cast out of Heaven in Stages? The narrative again recounts the conflict in heaven and Satan being cast out of heaven to the earth and then, as we will see, the rest of the chapter again goes over the persecution of the woman and her fleeing into the wilderness. Michael is the name used for Jesus especially when He is pictured in conflict with Satan. The name means "who is like God" and it is both a declaration that Michael is like God and a challenging question "who is like God?" (A question especially directed at Satan who is not at all like God but who declared "I will be like the most High" - Isa 14:14) Jesus is also referred to once as Michael the archangel (Jude 1:9) a reference to His being the head of the angels. The word "war" in this verse is interesting. It is from the Greek word "polemos" (Strong's #4171) from which is derived the word "polemic" which means a controversial discussion and, especially in theology, the "the art of controversial discussion." This war was not fought with swords or guns and bloodshed and death. It was a war of ideology. Is Satan's fall also linked to the cross in this passage in Colossians? Note, from the context of the passage in Colossians 2, how closely this spoiling is connected with the cross. But also note how that Rev 12:8-9 is connected with verse 10 which talks about the coming of God's kingdom. and Satan (then Lucifer), living in heaven before his fall, was fully exposed to the presence, love and character of God there was no further, no greater revelation of that goodness to induce him to repent. Is it possible (here is the new thought) that reconciliation was available even after Satan was cast out of heaven? Even up to the cross, since that was, of course, the greatest revelation of the love of God - it had never been seen before. We don't know the answer but Satan, very obviously, did not repent then or since. What we do know is that God will go the extra mile and far beyond when it comes to forgiveness. Just some thoughts. 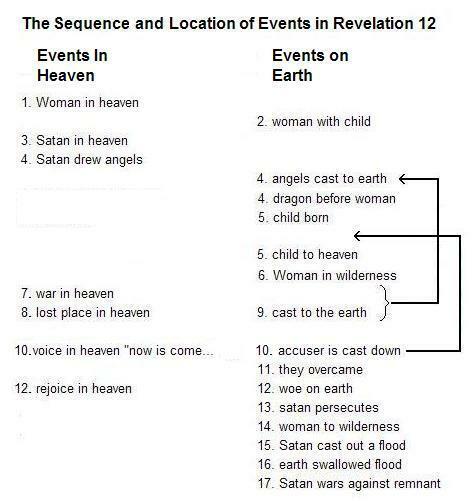 This similarity between John 12:31-32 and Revelation 12:10 is the reason I identify verse 10 with the crucifixion in the chart above. Note that in verse 32 the word "men" is supplied. When it says "all," it really means all - all the people of the earth and all the beings in heaven and throughout the universe. This ultimate demonstration of God's love may have even tugged at Satan's heart. However, he resisted and went on to persecute Jesus' followers and continue his rebellion to this day. His reaction to the cross and involvement in it would have resulted in him being cast out from having any sympathy among heavenly beings (if he still had any). They have rejected his side of the debate, seeing what he did to Jesus. "Now is come ... the kingdom of our God"
We are told to pray "Thy kingdom come" There is a sense in which the kingdom of God has not yet come - the Kingdom of grace is here but not the kingdom of glory. Although Jesus said this (Matthew 6:10 and Luke 11:2) before the cross, Matthew and Luke wrote it years later and it comes to us as something to pray for now and in the future. If we are to pray that it come, it is not here yet. You don't set up something that is already set up, already in place. This is not referring to the Second Coming. The stone is cut out from a mountain, which typically represents a church in scripture but that is another study. And Jesus does not fill the whole earth at His Second Coming; in fact, we understand that He does not even touch the earth. "Now is come ... the power of his Christ" (v10). Isn't this referring to the power of Christ being displayed through His people, the 144,000 who have been anointed as was Isaiah (Isaiah chapter 6)? These things happened for or because "the accuser of our brethren is cast down." All the things listed seem to happen as a result of Satan's fall. 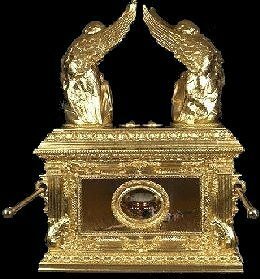 Go to Revelation 12 part 3 - the Blood of the Lamb.